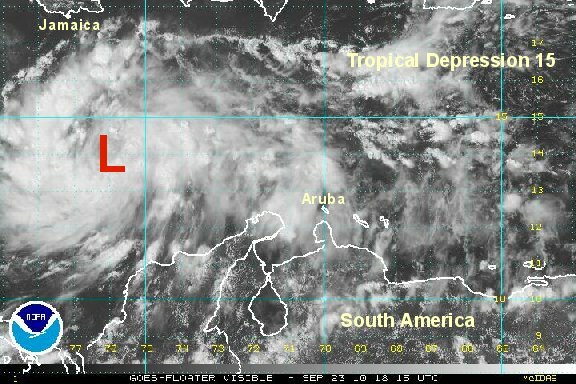 It appears that our next tropical depression has formed. Convection has increased markedly and there now seems to be a little spin. 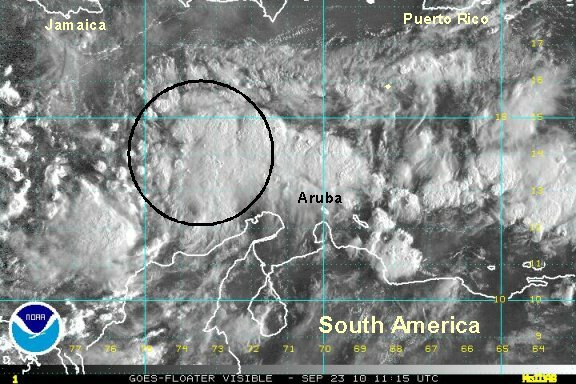 A hurricane hunter will report on the findings later this morning. 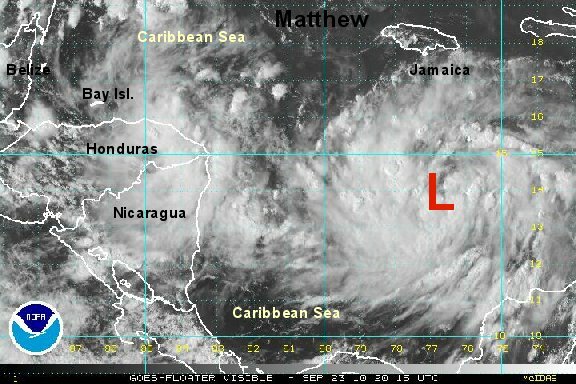 It is possible that it will be named Matthew if strong enough winds are found. As of 8 am edt / ast the tropical disturbance was centered roughly near 14.0° N / 75.0° W or about 540 miles east of the Nicaragua coast. Top sustained winds are estimated at 35 mph. Movement is west at about 15 mph. Pressure estimated at 1005 mb. Forecasts take this tropical system generally west toward the coast of Honduras / Nicaragua over the next couple of days. The recon hurricane hunter found strong enough winds to classify TD 15 as expected. Banding is taking shape and td 15 will likely be upgraded to tropical storm Matthew by this evening. Right now the expected path will take it near the coast of Honduras. The exact strength it will reach will depend upon how much land interferes with the circulation. As of 3 pm edt / ast tropical depression 15 was centered near 13.9° N / 76.3° W or about 475 miles east of Puerto Cabezas, Nicargua. Top sustained winds are estimated at 35 mph. Movement is west at about 15 mph. Pressure estimated at 1007 mb. Forecasts take this tropical system generally west toward the coast of Honduras / Nicaragua then toward Belize and Mexico. Interests on the northern Nicaragua coast, Honduras, Belize, Yucatan peninsula of Mexico and Florida should follow tropical depression 15 closely and make emergency preparations if necessary. Satellite imagery shows banding and deep convection organizing with Matthew. We think that winds are now up to at least 45 mph. Swell is predicted at 10-14 feet by NOAA under the deep convection. A buoy northeast of Honduras still has relatively calm seas at 4 feet. Outer rainbands are already moving into Nicaragua and Honduras. A threat for flash flooding will increase as Matthew gets closer overnight tonight and tomorrow. As of 7 pm edt / ast Matthew was centered near 14.0° N / 77.1° W or about 400 miles east of Puerto Cabezas, Nicargua. Top sustained winds are estimated at 45 mph (40 mph nhc - 5 pm edt advisory). Movement is west at about 16 mph. Pressure estimated at 1006 mb. Forecasts take this tropical system generally west toward the coast of Honduras / Nicaragua by Friday afternoon, then across the Bay Islands by Saturday afternoon. Matthew then is predicted to recurve north along the coast of Belize and Mexico toward Cozumel by early next week. It is predicted to be a hurricane near the coast of Belize and Mexico, but that will be highly dependent on if Matthew is inland or remains offshore. In the long range: Matthew is predicted to stall in the northwest Caribbean then possibly move north across western Cuba into Florida by late next week. Remember long range forecasts have a higher chance of error! Interests on the northern Nicaragua coast, Honduras, Belize, Yucatan peninsula of Mexico and south Florida should follow Matthew closely and make emergency preparations if necessary. As mentioned on our last update, Matthew's strength will be highly dependent on its track over land or water. Well, it looks like land. That will keep it from strengthening significantly. It looks like it is going to stay south of the offical hurricane center track which takes it over the Bay Islands and into central Belize. Right now, I'm leaning with a track south of this keeping it over land longer. Notice that the hurricane center changed their forecast from Matthew being a hurricane by early next week to now a tropical depression! Again, the track is critical. Do not stop following Matthew if it does follow this southern track and weaken....it may come back. Check the forecast below. As of 7 am edt / ast Matthew was centered near 14.3° N / 80.0° W or about 225 miles east of Puerto Cabezas, Nicargua. Top sustained winds are estimated at 55 mph (50 mph nhc - 5 am edt advisory). Movement is west at about 16 mph. Pressure estimated at 1000 mb. Forecasts take this tropical system generally west toward the coast of Honduras / Nicaragua this afternoon, then across the Bay Islands by Saturday afternoon. 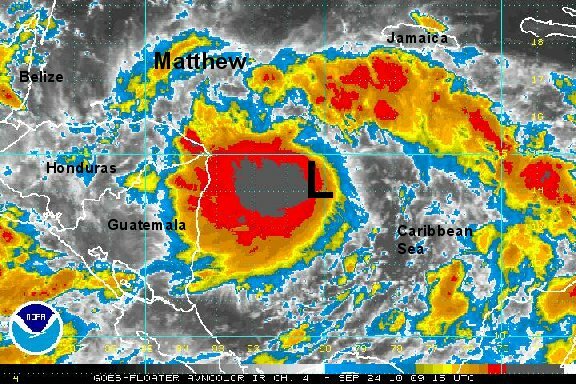 Matthew then is predicted to recurve north now inland in Belize and Mexico by early next week. It is predicted to be a tropical depression, but that will be highly dependent on if Matthew is inland or remains offshore. We prefer one of the forecasts that keep it south of this consensus forecast. If that is the case, it may cross into Nicaragua and Honduras south of the Bay Islands. In the long range: The forecast models have been predicting that a strong tropical cyclone will form in the northwest Caribbean and move across western Cuba toward south Florida late next week. It is unclear if this feature is Matthew moving back into the Caribbean or another low pressure area that forms near Central America. Remember, forecasts can have large errors in the long range. It is worth keeping an eye on the situation since the forecast models have been persistent with this scenario. Interests on the northern Nicaragua coast should have completed emergency preparations. 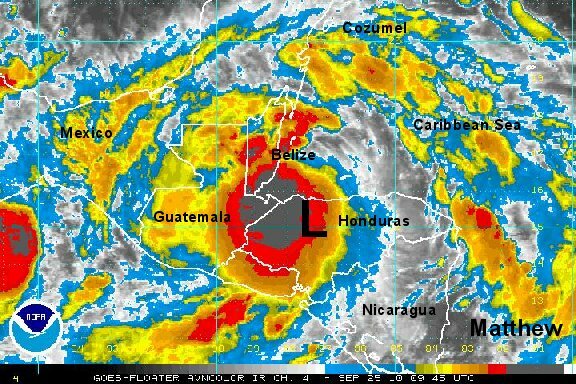 Interests in Honduras and Belize should now complete any emergency preparations if necessary. Interests on the Yucatan peninsula of Mexico and south Florida should monitor Matthew. The hurricane center has updated their new path to closely match the path we suggested in our previous update.....staying inland. Again, watch for a possible new development a few days after this in the northwestern Caribbean. Matthew made landfall about mid afternoon on the northeast coast of Nicaragua. Locally heavy rainfall of 5-10" or more is possible along the track. Flash floods may occur in especially higher terrain. Matthew is expected to stay inland and gradually weaken. As of 5 pm edt / ast Matthew was centered near 14.7° N / 83.7° W or over extreme northern Nicaragua. Top sustained winds are estimated at 45 mph (45 mph nhc - 5 pm edt advisory). Movement is west at about 15 mph. Pressure estimated at 998 mb. Forecasts keep Matthew inland over Honduras, Guatemala and southern mexico over the next 2-3 days. In the long range: The forecast models have been predicting that a strong tropical cyclone will form in the northwest Caribbean and move across western Cuba toward south Florida late next week. It is unclear if this feature is Matthew moving back into the Caribbean or another low pressure area that forms near Central America / northwest Caribbean Sea. Remember, forecasts can have large errors in the long range. It is worth keeping an eye on the situation since the forecast models have been persistent with this scenario. Despite being over land, Matthew's circulation is holding together very well. Heavy rain is moving across northwest Honduras, eastern Guatemala, and extreme southern Belize. Flash flooding may be expected in the path of Matthew with very heavy rainfall rates. Rainfall amounts of 5-10"+ can be expected. We are thinking that the track will still be a little father south of the official track and that Matthew will not move over the Gulf on Honduras and stay inland. Because of that we're not expecting strengthening. As of 6 am edt / ast Matthew was centered near 15.7° N / 86.3° W or over northwestern Honduras. Top sustained winds are estimated at 45 mph (50 mph nhc - 5 am edt advisory). Movement is west northwest at 16 mph. Pressure estimated at 998 mb. Forecasts keep Matthew inland over Central America over the next couple of days. In the long range: The forecast models have been predicting that a strong tropical cyclone will form in the northwest Caribbean and move across western Cuba toward south Florida late next week. It is unclear if this feature is Matthew moving back into the Caribbean or another low pressure area that forms near Central America / northwest Caribbean Sea. It now appears that the feature that eventually is predicted to form and move across Cuba will be a new system and not Matthew. Models are having a very hard time predicting what matthew will do. Some take it into the Pacific and others into the Gulf of Mexico! Right now, we're leaning with a more southern route for Matthew since that has been the trend. Remember, forecasts can have large errors in the long range. It is worth keeping an eye on the situation since the forecast models have been persistent with this scenario. Matthew weakened into a tropical depression earlier today. It did indeed cross the extreme western end of the Gulf of Honduras. Locally heavy rainfall is moving into western Guatemala and southern Mexico. Matthew is forecast to move slowly into southern Mexico into early next week. Keep an eye on the long range - forecasts still call for the remnants of Matthew or a new system to develop in the northwestern Caribbean Sea and move north by the end of next week. 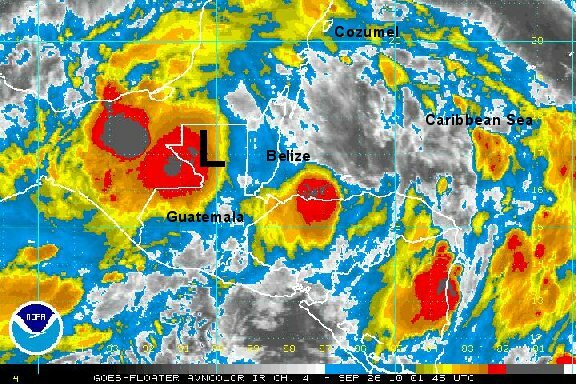 As of 4 pm edt / ast Matthew was centered near 17.0° N / 89.0° W or over northwestern Guatemala / Belize border. Top sustained winds are estimated at 35 mph (35 mph nhc - 11 am edt advisory). Movement is west northwest at 15 mph. Pressure estimated at 998 mb. 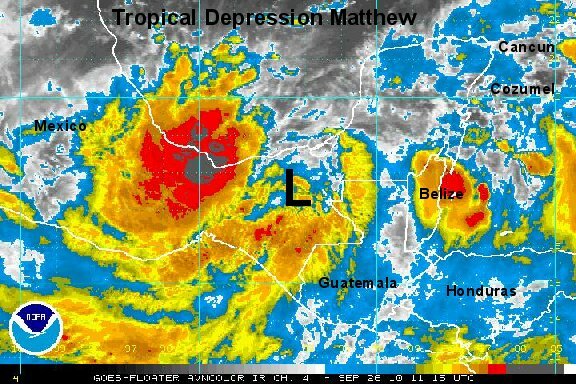 Matthew continues to produce heavy rainfall over southern Mexico and northwestern Guatemala. Rainfall amounts of 5-10"+ can still be expected. 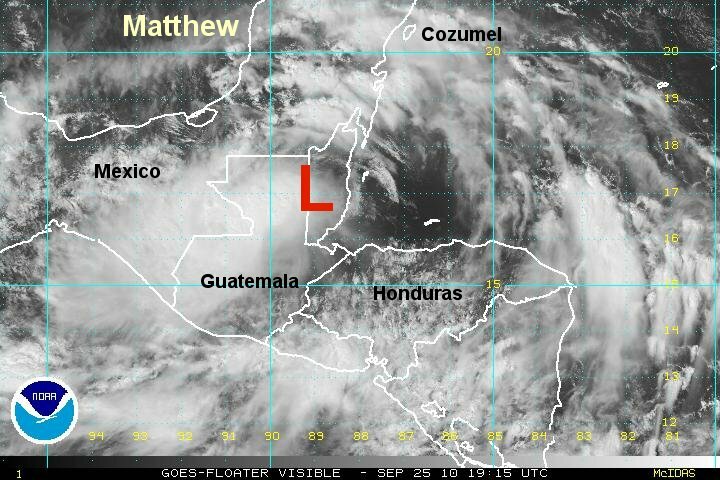 As of 11 pm edt / 10 pm cdt Matthew was centered near 17.0° N / 91.0° W or over northern Guatemala. Top sustained winds are estimated at 35 mph (35 mph nhc - 11 pm edt advisory). Movement is west northwest at 14 mph. Pressure estimated at 1001 mb. Forecasts have not changed much. They are still predicting a low pressure system to develop and move toward southern Florida late in the week. It remains unclear if this is the remnants of Matthew or a new system. Matthew is slowing down and bringing heavy rain to southern Mexico. The heaviest of the rain remains to the west of the ciruclation center. Rainfall totals of 5-10"+ are still expected to bring flash flooding. As of 8 am edt / 7 am cdt Matthew was centered near 17.3° N / 92.3° W or over southern Mexico. Top sustained winds are estimated at 25 mph (30 mph nhc - 5 am edt advisory). Movement is west northwest at 8 mph. Pressure estimated at 1003 mb. Forecasts continue to predict a low pressure system to develop over the northwest Caribbean and move toward southern Florida late in the week. 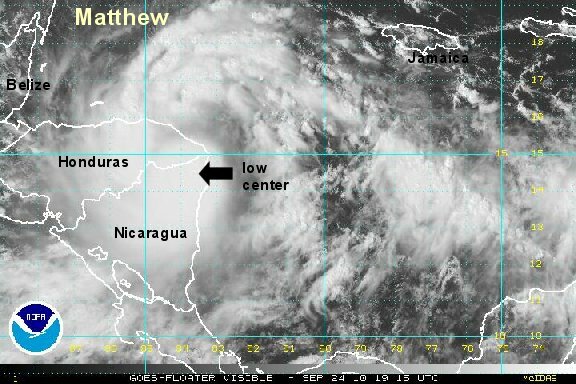 It is looking like a new disturbance will form over the northwest Caribbean and Matthew may "rain itself out" over southern Mexico.